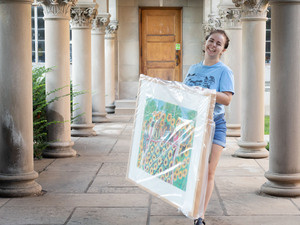 With about 400 original works of art available for students to borrow each semester, Oberlin’s Art Rental Program has something for everyone. Works by Picasso, Lichtenstein, Chagall, Goya, Toulouse-Lautrec, and Miró consistently are among the first chosen by students at the front of the queue. Students may select one or two artworks and take them to the checkout desk, have a valid Oberlin College I.D. and cash or check ready. No credit cards. The cost is $5 per work for the semester. Oberlin College faculty and staff also may rent but, like students, must hold their own place in line. The art rental line forms outside the back courtyard doors (north side of the museum building, off Lorain Street). The first group of five will be let in at 8 a.m.
Art rental return day will be between 9 a.m. and 4:30 p.m. , Wednesday, May 8 on the second floor of the museum. There will be a late fee of $10 per work per day for works returned on or after that date. Rentals may be returned any time the building is open, including weekends.